In 1988 President Ronald Reagan declared October as Pregnancy and Infant Loss Awareness Month. Unfortunately, the President had a very personal experience with infant loss during his first marriage, when his newborn baby died just 7 hours after birth. Many states have declared October 15th as Pregnancy and Infant Loss Awareness Day, but remembrance and events are seen throughout this important month. What do this mean to you? Awareness Month is a simple way to open the door to conversations about your feelings and your baby. You may want to talk to your family, friends, your community or maybe your spouse or significant other about your child who died. Wearing a pink and blue Pregnancy Loss Awareness Ribbon during October, or anytime, is a great way to increase awareness and honor your baby. You can buy a Pregnancy Loss Awareness Pin by visiting StockPins.com. The pins are well-made, inexpensive and arrive in a few business days. 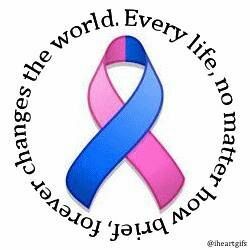 Pregnancy Loss Awareness Ribbons can be handmade with pink and blue ribbon or purchased. The pins should be worn on the left-hand side just above your heart- where your baby already lives. We post this information each year to share this very important event. Every October I remember the child I lost. I didn’t lose my child at the mall, or get separated at a park. I actually didn’t “lose” my child at all…my baby died. Even all these years later, it is still difficult to say it like that. My husband and I had waited ten years to have children because I traveled frequently and I was finally settled and ready. But our “best laid plans” were about to take a horrible turn. It was just before Halloween and I was 3 months pregnant with our first child. My two sisters had five children between them and I was finally going to join them in growing the family. I had not considered, even for a moment, that something could go wrong. But something went terribly wrong. Over the next few weeks my pregnancy unraveled and my baby, and my hope for a family, was gone. In the empty space where my baby had been was confusion, disbelief, anger, numbness and incredible pain. Fourteen years have passed. We now have two perfectly healthy, and perfectly wonderful daughters and I smile and get misty as I write these words about them. But I do still think back to the child I will never know. I wonder what my baby would have looked like and sounded like and what kind of person he or she might have been. I still wonder…but it doesn’t hurt as much now. There was a time that just typing these words would have left me sobbing. Time does heal, but it doesn’t make us forget. I do still think about my baby. Especially this time of year. But now, I can wonder and move on, as anyone who is grieving must do at some point. If you are hurting from the pain of grief, remember that time will go by. The intense pain will pass and one day you will notice that the daggers of grief are now a dull ache. Your life will return to a new version of “normal” and you will go on. 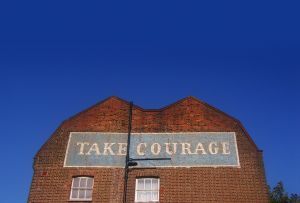 Be brave enough to remember the loss of your past and move steadily toward your future.